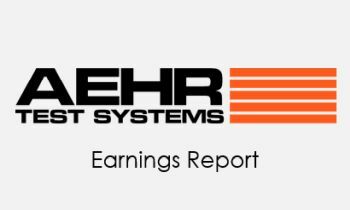 FREMONT, Calif., Sept. 13, 2018 (GLOBE NEWSWIRE) — Aehr Test Systems (NASDAQ: AEHR), a worldwide supplier of semiconductor test and burn-in equipment, today announced that it will report financial results for its first quarter of fiscal 2019 ended August 31, 2018 on Thursday, September 27, 2018 following the close of the market. The Company will host a conference call and webcast at 5:00 p.m. Eastern time to discuss the results. What: Aehr Test Systems first quarter fiscal 2019 financial results conference call. When: Thursday, September 27th at 5:00 p.m. Eastern Time (2:00 p.m. PT). Dial in number: To access the live call, dial 800-458-4121 (US and Canada) or +1 323-794-2093 (International) and give the participant passcode 6249614. Call Replay: A phone replay of the call will be available approximately two hours following the end of the call through 8:00 p.m. ET on Thursday, October 4, 2018. To access the replay dial-in information, please click here.